Within a completely new line of research, we are exploring the power of modeling for human behaviour analysis, especially within social networks and/or in occasion of large scale live events. Participation to challenges within social networks is a very effective instrument for promoting a brand or event and therefore it is regarded as an excellent marketing tool. Our first reasearch has been published in November 2016 at WISE Conference, covering the analysis of user engagement within social network challenges. the effectiveness of each action in light of several other factors (time, repetition, third party actions, interplay between different social networks, and so on). We evaluate the model through a set of experiment upon a real case, the YourExpo2015 challenge. Overall, our experiments lasted 9 weeks and engaged around 800,000 users on two different social platforms; our quantitative analysis assesses the validity of the model. The paper is published by Springer here. Today Andrea Mauri presented our paper “Community-based Crowdsourcing” at the SOCM Workshop co-located with the WWW 2014 conference. SOCM is the 2nd International Workshop on the Theory and Practice of Social Machines and is an interesting venue for discussing instrumentation, tooling, and software system aspects of online social network. The full program of the event is here. Our paper is focused on community-based crowdsourcing applications, i.e. the ability of spawning crowdsourcing tasks upon multiple communities of performers, thus leveraging the peculiar characteristics and capabilities of the community members. We show that dynamic adaptation of crowdsourcing campaigns to community behaviour is particularly relevant. We demonstrate that this approach can be very e ffective for obtaining answers from communities, with very di fferent size, precision, delay and cost, by exploiting the social networking relations and the features of the crowdsourcing task. We show the approach at work within the CrowdSearcher platform, which allows con figuring and dynamically adapting crowdsourcing campaigns tailored to different communities. We report on an experiment demonstrating the eff ectiveness of the approach. 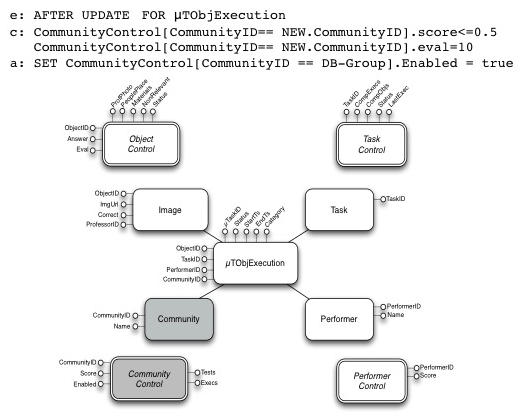 The figure below shows a declarative reactive rule that dynamically adapts the crowdsourcing campaign by moving the task executions from a community of workers to another, when the average quality score of the community is below some threshold. The full paper will be available on the ACM Digital Library shortly.